This week StyleSage partnered with Thomson Reuters on the outlook for the upcoming Black Friday and Cyber Monday shopping extravaganzas. Here are some key insights from our analysis. See the full report here. Right now, the average promotional discount is 37.3% and it's been at this level for months. Promotional discounting is clearly a tough habit for retailers to kick. However, what is changing is the frequency with which retailers are engaging in promotional messaging. We've seen a 42% increase over the last 4 weeks in promotional emails and a 12% increase in the number of active promotions. We're also seeing more category-focused promotions right now - rather than blanket ones - for Black Friday and Cyber Monday, and based on historical trends, we anticipate those will turn into site-wide discounts. When you get down to the item-level discounts, with the exception of Value sector, we're not seeing major changes from one year ago. We looked at two key metrics: average discount amount and discount penetration (how much of the assortment is on sale). In tandem, these tell you how well retailers have been able to hold steady on their starting price and ultimately, if this matches customer demand. Below you can see the sector-level data. We saw positive decreases in Value sector discount penetration and discount amounts, which indicates that retailers in this sector may have made smarter assortment buys for holiday. For the other sectors, the discounting is more or less consistent with 2016 data trends. Yet it remains of concern that nearly two-thirds of mid-market retailers' inventories are on sale. The question is how long this sector can sustain this widespread discounting. 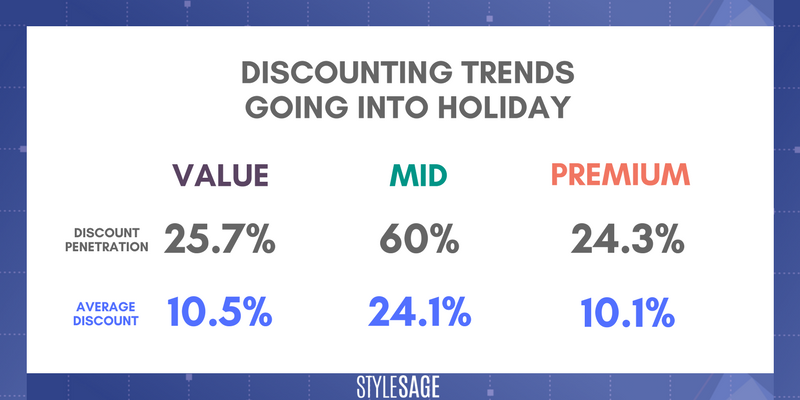 StyleSage data shows that Sleepwear/Intimates, Jeans, and Activewear have the lowest discount levels going into the holiday weekend. Everyone talks about what is on sale - but what's interesting is what's not on sale - our data shows that some of the more staple categories of activewear, intimates, and denim are least likely to be on sale right now. This also aligns with last year's trends going into and throughout the holiday season. Stay tuned here next Tuesday for a full post-mortem on Black Friday and Cyber Monday.